The above is a screenshot from Krazydad ("Creator of handcrafted software toys of wondrous delight"). It's the Flickr Experimental Colr Pickr, devised by Jim Bumgardner, and, it's a delight alright. This, along with the other Flickr stuff in this post, has been sitting on my hard drive for at least a week. While having fun with all of it, I was ambivlent about blogging it because - get this - it seemed like just so much pretty eye candy. Then it came to me, limping on the knees of middle age: what better thing to share? Jim used the Flickr API documentation to create Colr Pickr. 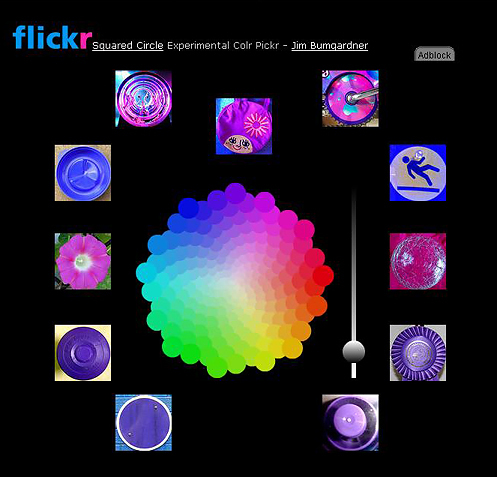 Colr Pickr offers twelve themes to choose from (such as "color fields", "flowers", "urban decay", "catchy colors") and a color wheel with a slider beside it. Click on a theme, then click on any point in the color field, and Colr Pickr will pull up the appropriately themed and hued images from Flickr. You can then use the slider to change the color value (light to dark) and thereby the images. It's really fun and beautiful. "To those that question the utility of this little application, let me point out that it is a toy -- like all the stuff on my website. It's purpose is simply to provide wonder and delight. Nothing more, nothing less. Isn't that enough?" Spell with Flickr is another cool app developed using the Flickr API. This one involves inputting a word, phrase, or URL in the search box and clicking "spell". Spell with Flickr then finds Flickr images and uses them to recreate your input, in the form of images. Lastly, I've been finding great images on Flickr. 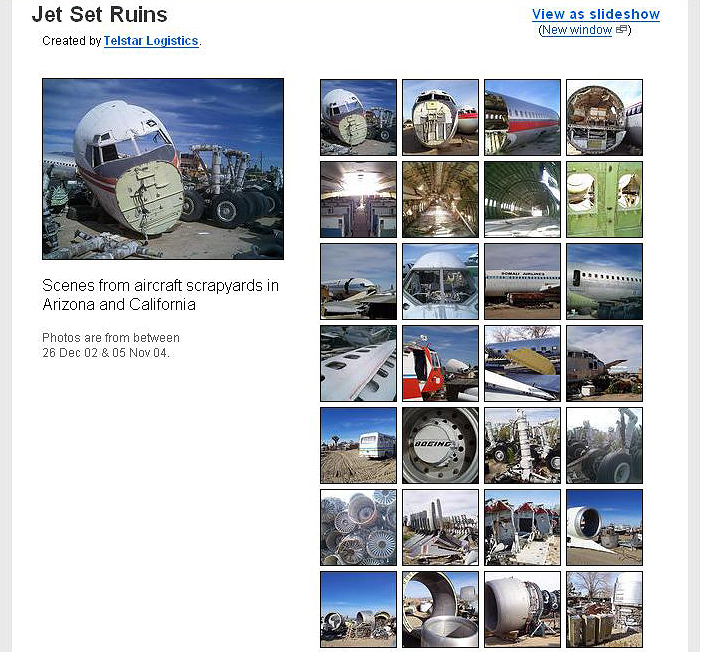 Sometimes entire collections are interesting, like the one documenting a graveyard of commercial jets. So there you have it. Two toys among many for Flickr, and an interesting photo collection, one of . . . well, quite a few. (I've been involved in lots of photo sites, and some of the images on Flickr are exceptional.) Yahoo clearly got this site at a bargain price, and has some interesting times ahead.